An incredible season draws to a close for Stanford (18-6, 6-1 Pac-12) after a tough NCAA tournament push. First round success against No. 41 Tennessee could not give the team the momentum it needed to topple a strong No. 10 Duke side. Stanford was on the road for its first-round matchup. The Cardinal lost their first two doubles matches to concede a vital doubles point. First, Tennessee’s No. 4-ranked doubles team of Libietis/Reese took down Stanford’s No. 9-ranked team of Morrissey/Stineman 8-4. In somewhat of a surprise, No. 69 Tom Fawcett and Maciek Romanowicz lost 8-5 to unranked Dromsky/Smelyanski. This was only the second time all season that Stanford gave up the doubles point and then moved on to win the game. The only other occasion was in its dramatic 4-3 victory over Berkeley. A strong showing from the Cardinal in the singles matches allowed Stanford to recover. Stanford took three straight matches to change the momentum of the match completely. Nolan Paige made quick work of Dromsky at the No. 6 court in his 6-2, 7-5 victory to even up the score before Robert Stineman followed up with a 6-2, 6-3 win on the No. 5 court against Jess Jones. The victories continued up the ladder with David Hsu winning his 11th straight victory, coming back against Luis Valero on the No. 4 court in a 3-6, 6-1, 6-2 match. No. 26 Tom Fawcett could not come out on top in a match-up of ranked players against No. 14 Mikelis Libietis. Fawcett fell 6-4, 7-6 (6), which left it up to the other remaining freshman, David Wilczynski, to close the game out. Wilczynski is the only player in Stanford history to play a match at all six singles spots over the course of a single year. He’s proved himself both versatile and vital over the course of the season, and he topped off a stellar freshman campaign by clinching the match at the No. 3 spot. He triumphed over Jack Schipanski in a well-contested 6-3, 4-6, 6-4 matchup to send Stanford through. Fortunes were quite different when Stanford moved on to play Duke. Stanford opened the match with incredible heart and managed to grind out an incredible doubles point. No. 9 Morrissey and Stineman pulled out an 8-7 (3) win over Duke’s No. 20 Alvarez/Hemmeler. This preceded another battle between No. 69 Fawcett and Romanowicz and Duke’s Levine/Tahir. 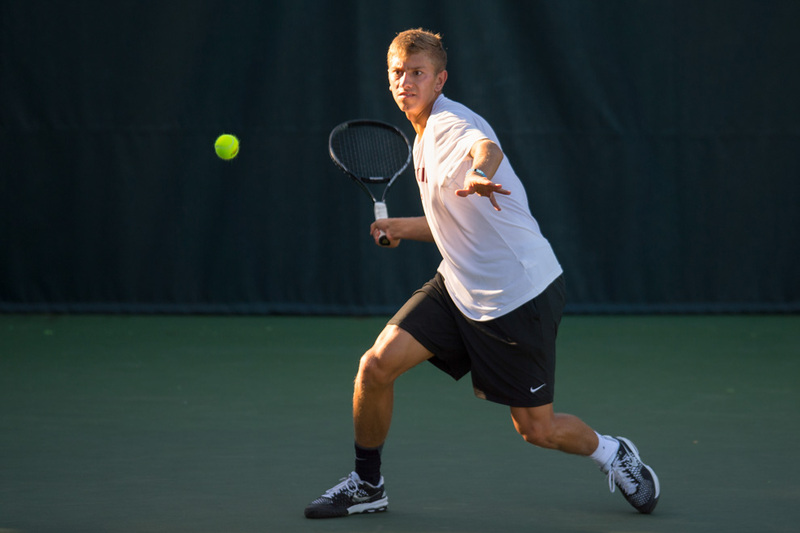 Stanford pulled out an 8-6 win to clinch what could have been a vital doubles point. The momentum quickly went to Duke, though, when the singles matches started. Fawcett could not pull the upset against Duke’s No. 14 Nicholas Alvarez, who won 6-4, 6-0. Stanford was then dealt losses on the Nos. 4 and 3 courts. First David Hsu fell to Bruno Semenzato 6-2, 6-3, and then David Wilczynski took a 6-4, 6-4 loss against No. 57 Raphael Hemmeler. Duke only needed one more point and was given it by TJ Pura, who defeated Nolan Paige 5-7, 6-4, 6-3 on the No. 6 court. Although it was a tough defeat, Stanford leaves with its head high after a season that saw the team clinch a share of the Pac-12 regular season and get its first post-season victory since 2012. Even though seniors John Morrissey and Robert Stineman won’t be around to participate in the further development of this program, the overall sentiment around the team is wildly enthusiastic for what is expected to be a bright future. “After our NCAA run had come to a close, the locker team mood was not purely an unhappy one,” Wilczynski said. “Of course each and every one of was wished we could have gone further into the tournament, but we came together and reminisced on all that we had accomplished this year.